Yejide and Akin are prepared to have a happy marriage and keep their families and their traditions at arm's length while pursuing a modern Nigerian life. But after years after marriage, Yejide still is not pregnant. They have been to specialists, tried drinking teas to boost fertility, and Yejide is even considering visiting the healer who lives up on a mountain. The decision is made for her when their family shows up with a second wife for Akin. The repercussions of that choice will drive the couple to the brink and force them to decide how hard they will fight for their marriage. Stay With Me reminded me of Fates and Furies in certain ways. Both tell the story of a marriage from alternating points of view. You may think you know what is going on until you get the other spouse's side of the story and suddenly, your whole perception of the relationship and the people in it will change. 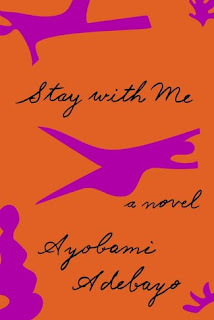 Both Yejide and Akin do some outrageous things in their attempts to save their marriage and themselves. It's both incredibly specific to Nigerian culture, and familiar to anyone who discovers that marriage and having a family isn't quite what you expected. Anna Kerrigan works at the Brooklyn Naval Yard as the only female diver. She spends her days defying the expectations of her boss and repairing the massive ships that have been damaged in the war. When she meets the notorious Dexter Styles one night, she remembers going to his home many years ago with her father. Anna sets out to discover how the men knew each other and if Styles might be responsible for her father's disappearance. I may be the only reader who picked up this book without reading Egan's Pulitzer Prize-winning novel A Visit from the Goon Squad first. I can't resist a well-told historical fiction novel and this is certainly one. Ms. Egan writes place like few other authors, and you will feel like you are dancing in a WWII-era club or walking through the Naval Yard on your way to work. My only qualm with Manhattan Beach is the change in perspective towards the end of the story. It didn't really add anything for me and I found myself wanting to be back with Anna. I would have read her entire life story, so I'm excited to go back and read Egan's earlier books. 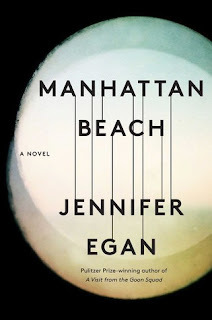 I really really liked Manhattan Beach -- it’s radically different, style-wise, from Goon Squad, so if you loved this, you might not like Goon Squad quite as much. I haven’t read STAY WITH ME yet, but it got great reviews last year. I am so impressed with authors who can write wildly different books. I'm going to give Goon Squad a try and see how it goes! I liked Manhattan Beach, but like you the ending left me a little cold -- partly for plot reasons, partly it just felt forced. But the story of Anna, her father and Dexter was really enjoyable.